Scott McLeod, of the Dangerously Irrelevant blog, has annually put out a call to educational bloggers to join him in offering advice to school administrators on the ways of the digital learning environment. Scott hopes that by bringing more administrators into the fold, the more likely it is that substantial changes will take place in the schools where they lead. I agree. 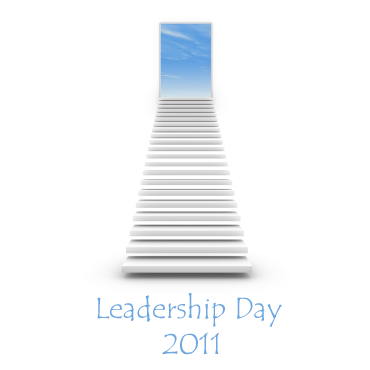 Today is Leadership Day and if you follow Scott’s blog, he will no doubt be posting a link to all of the blog posts that are being shared on this day. 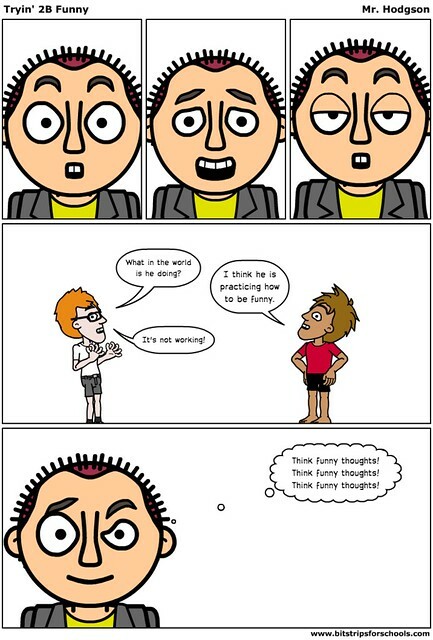 Here is mine, done as a comic. Now I know that not everyone is going to take my messages here seriously, because it is a comic. But I suspect there will be a lot of different posts with writing only, so I wanted to go in a different direction. I tried to put some of the ideas that I have heard from my students into the comic strip, as best as I could. 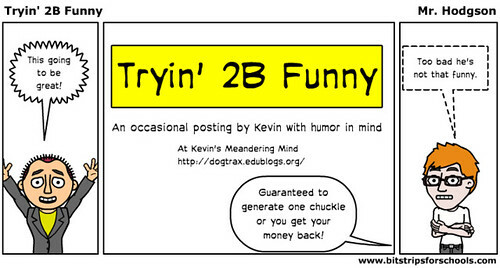 Tryin’ 2B Funny: Why Not Squirrel Week? I don’t know about you, but I don’t live too close to the ocean so all this hoopla over Shark Week goes right over my head. I don’t encounter enough sharks to make it worth my while to worry about them (famous last words?). But squirrels? We’ve got more squirrels than you can shake a nut at. Squirrels attack in small hordes. Sharks are almost always alone. Which would you rather avoid have chasing you down the street: a pack of wild squirrels or a single flopping shark? Squirrels know how to set traps. They dig all the time. No, it’s not nuts they are burying in the yard. Those are tiny explosives known as AEDs or Acorn Explosion Devices. Have you ever seen a shark detonate a bomb? I didn’t think so. Squirrels can use their tails as a whip. Just watch them sometime (safely, from your house). Those bushy tails can reach up to 100 miles an hour. Sure, a shark has a tail. But it’s for swimming. It’s different. Squirrels can sleep. Sharks can’t. So, the use of sleeping potions could potentially kill off any shark predators. But not squirrels. They would wake up, well rested, and ready for attack mode. You don’t want to mess around with a well-rested squirrel. Squirrels can make their way into your house. Through chimneys (trust me on this one. It happened to me); through doors left open by unthinking children (but what do they do when the squirrel gets in the house? They scream. Why didn’t they think of that when they left the door open? ); in backpacks; and through squirrel invisibility cloaks. A shark? You’d have to lug it into your house in the largest tub of water imaginable. It’s unlikely a shark is going to come into your house. You may have read that The News of the World was shut down after the phone hacking scandal. What you probably didn’t know is that in a closet in the newsroom, just near the snack machine, is a data base of my phone records. Like you, I am shocked. Mostly, I am shocked because the phone conversations of my family are pretty boring and I feel pity over the fool who had to go through them to find salacious details. Needless to say, we never made the front pages of the now-defunct newspaper. Child: Did you text me? Child: What did it say? Friend (audible sigh): Read it. Father: …. frigging’ thing … who makes these buttons so damned sm..
Father: Oh, you there? It must have rung through. Mother: Hi. Who is this? Mother: Hold on. I need to adjust the phone. I can’t hear you. Mother: OK. Try it now. Father: You can hear me? Father: We need more milk. Can you get some on the way home? Mother: What? I seem to have lost y…. Toddler: ‘ello? ‘ello? ‘ello? MOMMMMMMY ….. ‘ello? ‘ello? Father: There’s no Rufus here. You’ve got the wrong number. Stranger: What do you mean, no Rufus? He gave me this number. He owes me money. You sure there’s no Rufus? Father: What? You think I would misplace a kid named Rufus? There’s no Rufus here. Sorry. Stranger: Are you Rufus? That you, Rufus? You hiding your voice? Father: Listen. For the last time, there’s no one by the name of Rufus here. Goodbye. There are plenty of people writing about interesting projects that connect technology with learning but one of the small few whom I have consistently looked to for guidance and inspiration over the years has been Wesley Fryer and the posts he shares at his blog, Moving at the Speed of Creativity. His work around digital storytelling (see the Storychasers project) and use of audio podcasting for learning, in particular, have opened up a lot of possibilities over the years. For the past few months, I have been watching from afar as Fryer has been putting together an ebook about using media for learning (see his blog post about his experiences of publishing an ebook). Now the ebook is out, and I have to say, Fryer does an outstanding job of balancing practical knowledge of various elements of technology with the deeper understanding of the rationale behind bringing such tools into the classroom. The ebook — Playing with Media: Simple Ideas for Powerful Sharing — is, as the genre suggests, only in digital format, and as usual, Fryer takes full advantage of the possibilities, embedding video tutorials, audio files, and hyperlinks galore that will have you moving in and out of this resource with ease and interest. Using his own young family as the source for many of the projects here, Fryer’s use of digital stories and other media projects showcase how voice and creativity and technology can come together in powerful ways. The result is a rich learning experience that should open new doors for exciting work in the classroom, particularly for those educators who are still struggling with getting that first step moving forward. Fryer is a patient, wise guide. One of the themes of Playing with Media is that technology and media tools can tap into students as creative composers. Fryer notes that he purposely chose the word “playing” for the title of this book because he wants teachers to understand that exploration and creativity are crucial to the path of learning. I couldn’t agree more, and I think if educators can see the world of emerging tools through that lens, they may be more likely to “play” themselves and allow students time and space to do the same. The aspect of “play” allows for the possibility for small failures and unexpected pathways. That’s OK. That’s part of the experience. Another theme that comes up a number of times here is the “Ethics of Minimal Clicks,” which Fryer articulates throughout various chapters. It seems obvious to me now in hindsight, but for new users of technology, the fewer the number of clicks, or steps, that one has to do to set up and use a blog, or a wiki, or a podcast, or work on a video, the more likely that activity will make its way into the classroom. I applaud Fryer for laying out such a simple, yet powerful, idea in such clear terms. A witty phrase helps, too. Using this “Ethics of Minimal Clicks” as a sort of structural underpinning of much of the content, the book examines such sites as Posterous for blogging, Wikispaces for wikis, and Cinch for podcasting. The ease of use should make it rather effortless for teachers to bring students into the world with technology. Two other topics stuck out with me, too: audio and video. Fryer focuses in on the power of audio, and podcasting, and how the use of student voice for a variety of projects can transform not only writing but also publishing. As Fryer notes, audio can be done rather cheaply (using Audacity for recording and Audioboo for hosting, for example), yet giving voice to student stories and opinions and publishing those thoughts to the world is transformative for many classrooms. When it comes to video, Fryer advocates the consideration of “no edit” video production. Instead of getting bogged down in using MovieMaker or iMovie for editing, students can create videos quickly in a “no edit” mode that basically comes down to “what you shoot is what you get” and then you move on. I like that idea because it makes a video project a little easier to manage. And it paves the way for the possibility of a larger, more careful video project, too. Getting your feet wet is sometimes half the battle — for teachers as well as for students. There are plenty of books out there that are tapping into the tools of the 21st Century, and Fryer’s ebook should join the mix of some of the more useful and interesting out there right now. His engaging writing style, inclusion of very useful resources and tutorials, sharing of authentic examples and explanations of the pedagogy behind the technology make for an enjoyable and productive read. I highly recommend Playing with Media: Simple Tools for Powerful Sharing for any Kindle, Nook, iPad or whatever your device might be. Listen, friend. No, wait … friend is the wrong term. That’s used by that other network. The one you have wisely scorned and ignored, even though all of the people you know are there. Don’t go there. Trust me. Listen, tweep. Wait. Hold on. That just sounds dumb. Why is it that you humans reduce cool technology to vocabulary that sounds like three 5-year-olds talking? Anyway, listen, we have to talk. I’ll make it brief, but longer than our traditional 140 characters. ‘Cause this is important. I notice that you have started using that new Plus site by Google. Or is it +? You don’t even know what to call it, do you? Plus? Plus what? Don’t they have someone on staff at that place who can come up with a catchy name? Anyway, what I wanted to say was, go ahead and feel your oats or whatever your human phrase is and play around with what will surely be another failed venture by Google. Remember Buzz? Wave, anyone? Wave goodbye is more like it. And then, after you realize how lacking it is, come on back to me, baby. You know Twitter is where it is at. Ignore that piece in Newsweek that noticed how many of my founders have split the scene. They were losers. Visionary losers. It means nothing. And sure, the fact that MySpace has crashed and burned is a bit … unsettling … but that’s what you get when Rupert Murdoch takes you over and uses you for an advertising base to teenagers. I mean, come on. Teenagers? That’s what you build a company on? They’re the most fickle creatures in the world. Now, wait a sec … so we do now have a few ads popping up in your Twitter stream. No … big … deal. We’re just trying to bring in some cash so that we can keep Twitter alive and well, and working just for you. What? You don’t think Google is not going to do the same thing with … what is it? … oh yea, Plus. Don’t be a fool. Google (Plus) You means advertising dollars in their heads. Cha-ching. Don’t you forget it! But you will always have a place here at Twitter. So go on, explore and see what I mean. I’ll see you soon. Don’t listen to that twitterin’ fool. He’s just a tiny version of us. Every now then, I get the urge to try my hand at humor. I’m not saying it works. But I try. It usually comes to me in odd moments, like when I am walking the dog, or playing my saxophone, or reading the newspaper in the mornings. Most of the time, I let those odd thoughts go. I wouldn’t want too many folks to think I am that odd. Other times, I think: I should write that down. Then I forget what I was thinking. When I do remember, and I do write them down, they are never as funny as when I first thought up the idea. Why is that? Anyway, this week, I am going to try to share some humor writing here. So, consider yourself warned. Here are some past posts on the humor theme.